In the van’s rear window was the sign “Nashville or Bust.” The van’s driver turned onto I-75 and sped south out of metro Detroit, weaving in and out of traffic gone, gone, gone, like Detroit’s done him wrong. Nashville and Alison Krauss here he comes. Ohio state police and their notorious speed traps weren’t going to slow this guy down from pursuing his dream. Detroiters can make paper airplanes and throw them to Nashville. 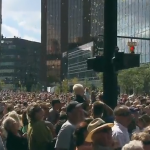 Rob Bliss, the producer of the Grand Rapids American Pie lip dub music video, had a 2009 ArtPrize where he dropped 100,000 paper airplanes over Grand Rapids. Detroit is in need of a paper airplane party. Or become a sister city to the town of Bust in France. Former Detroiter Jack White of White Stripes was named City Ambassador for Nashville. How many more days can metro Detroiters smile with a frown, knowing in their soul it’s almost over, singing the lyrics to Alison Krauss & Union Station’s Paper Airplane like the van driver with the “Nashville or Bust” sign must have done, the Motown sun growing cold on his shoulder and love for Detroit dying in the rear view mirror. 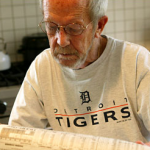 Elmore Leonard, Detroit’s great crime writer, won’t move or stop writing crime novels which he had been doing by hand for six decades. 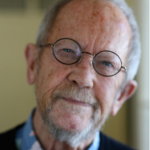 From a story on Elmore Leonard by NPR last year. “On a nice day in Detroit, you might take your kids to Bell Isle, near downtown, to feed the geese. Or, if you’re a crime writer, you might set a scene here. Perhaps, in the icy dark, a murder weapon goes into the Detroit River, or a car blows up on the bridge. Leonard still remembers when Detroit had 700 murders a year. And any tour of Leonard’s city will stop in front of the police headquarters on Beaubien, at No. 1300. Leonard spent long weeks at the station, and in the bars nearby, listening to the homicide detectives. He recalls sitting in the courtroom at the Frank Murphy Hall of Justice, taking notes about stories that wouldn’t occur to a fiction writer.